20 So where does this leave the philosophers, the scholars, and the world’s brilliant debaters? God has made them all look foolish and has shown their wisdom to be useless nonsense. 21 Since God in his wisdom saw to it that the world would never find him through human wisdom, he has used our foolish preaching to save all who believe. 22 God’s way seems foolish to the Jews because they want a sign from heaven to prove it is true. And it is foolish to the Greeks because they believe only what agrees with their own wisdom. 23 So when we preach that Christ was crucified, the Jews are offended, and the Gentiles say it’s all nonsense. 24 But to those called by God to salvation, both Jews and Gentiles,  Christ is the mighty power of God and the wonderful wisdom of God. 25 This “foolish” plan of God is far wiser than the wisest of human plans, and God’s weakness is far stronger than the greatest of human strength. The lighting for this scene comes from the flames below the scene & from the pale white light of Heaven in the background. This cartoon features a long line of people, walking from left to right, heading in one of two possible directions. Below the cross, there are two preachers, a man & a woman, who are urging the crowd that passes the cross to listen to the Christian gospel. The male preacher, who’s standing on a rock, is pointing up at the cross & indicating the way to heaven, whilst the female preacher is beckoning people & encouraging them to follow the pale winding road that leads up to heaven. If you look at the the line of people walking past, you’l see a variety of reactions to the preachers: some people are laughing, some are angry, some are listening, some are ignoring, some are choosing to go their own way. 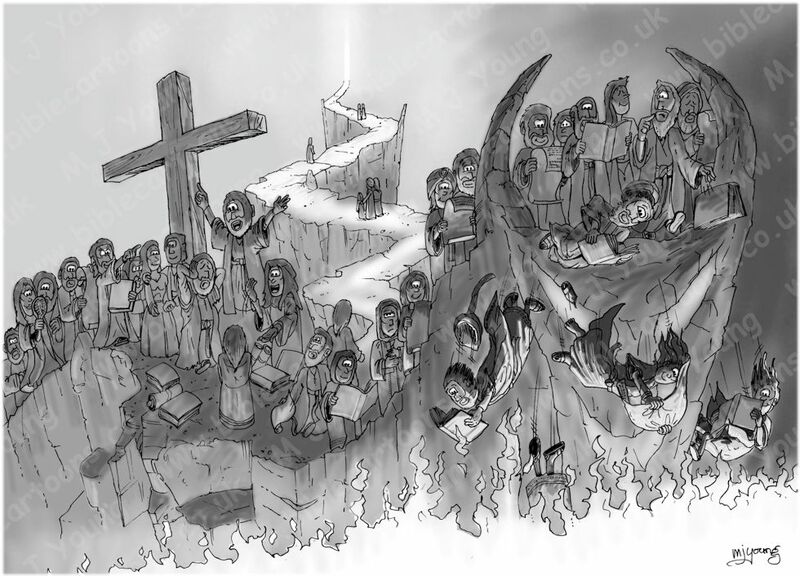 A few people have chosen to believe the preachers (they have become Christians) & we see them heading up the pale, winding road, which ultimately leads to Heaven. There is a family of three people (including a child), a single person, & a couple. Unfortunately the vast majority of people have chosen to ignore the Christian gospel & it’s preachers, & we see them walking down a pathway, & up a steep gradient to the end of the road, which is on the right of the picture. Here we see people falling into the flames. These people are blissfully unaware of their condition, as they are engrossed in reading books & scrolls, which represent the “human wisdom” mentioned in the above Bible passage. When I read this Bible passage, the idea immediately “jumped out at me” & I knew that I just had to draw this scene. I did not draw this cartoon illustration to be judgmental. Nor is it meant to be amusing or funny. In fact, the point it makes is deadly serious. I want it to be a warning to unsuspecting people, that they may be heading for eternal disaster without even realising it. This is really happening, today. People hear the Christian Gospel & ignore it at their very real eternal peril. I wanted to represent human wisdom in some tangible way, & have chosen to show most people reading books & scrolls. These items represent all the human wisdom of all history: past & present ideas, scientific theories, philosophies, other world religions, in fact, any & every way of thinking that we human beings have come up with. Whilst the theory of evolution; science & modern technology; other religions; materialism & all philosophies may sound good, they are all unable to solve the essential issue that faces each & every one of us: what will happen to me when I die? It really is all too easy to be “blind” to our very real danger: the danger of rejecting Jesus Christ & therby missing our chance to to be saved from eternal separation from God (which is what Hell is) by ignoring the Holy Bible & the Gospel. I wanted to draw this cartoon illustration as a kind of alarm call for anyone who looks at it, to get them to wonder about their own lives & to check which direction they have taken. I would hate anyone to miss the opportunity of gaining eternal life, because they have not taken a good look what Christianity offers. 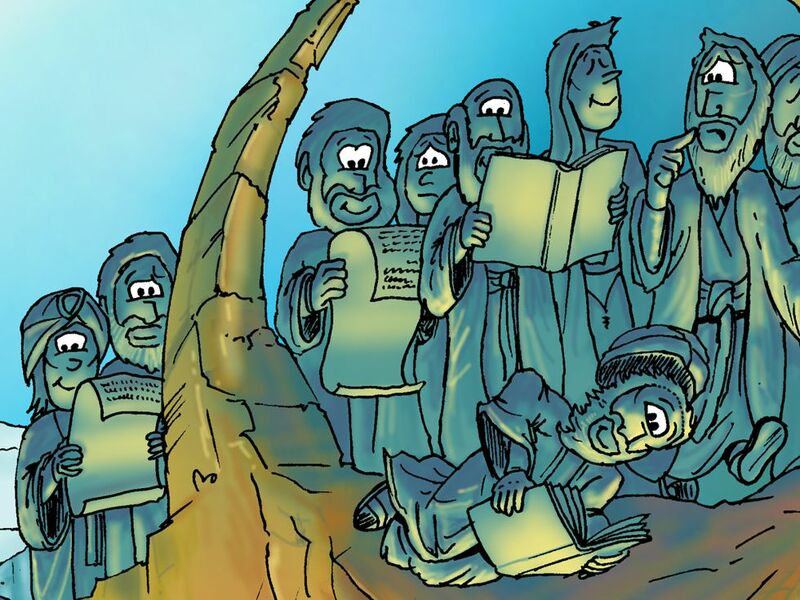 So, in my cartoon ilustration, the books & scrolls represent “human wisdom”, which the Apostle Paul is writing about in 1 Corinthians 1. 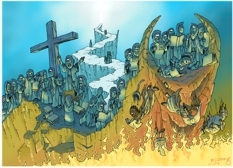 According to the Holy Bible, there is only one way to Heaven & that is through Jesus Christ. Jesus said, “I am the way and the truth and the life. No-one comes to the Father, except through me.” (John’s Gospel 14:6) What this means is that we are to believe that Jesus is God’s Son & that He is able to save us from eternal separation from God the Father (Hell) by removing our sins & making us right with God. No other religion in the world offers this. Christianity stands alone as the religion which offers a real, viable, possible, personal relationship with the Living God. 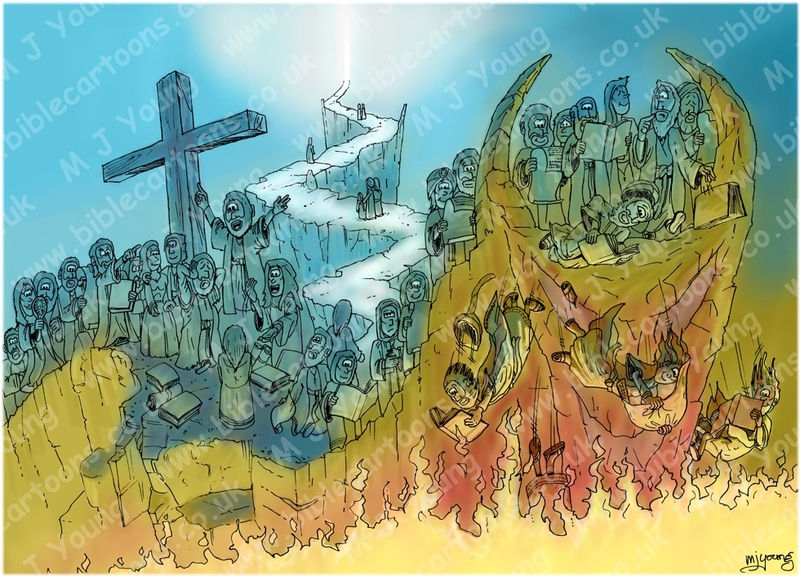 The Apostle Paul writes, in verse 18, “I know very well how foolish the message of the cross sounds to those who are on the road to destruction.” In my cartoon, the road to destruction is the pathway most of the people are on… it heads to the precipice & a long drip into the flames. Paul continues in verse 21, “Since God in his wisdom saw to it that the world would never find him through human wisdom, he has used our foolish preaching to save all who believe.” The two figures trying to gain the passing crowds attention are representative of all the preachers of the Gospel who have ever lived, & tried to convince other people of their eternal peril. Our current way of thinking is that if we have a good job, make lots of money, buy the latest gadgets, & entertain ourselves enough, then we will be happy. Unfortunately, all the “stuff” of modern life doesn’t seem to quite hit the mark. There really are only two possible ways of viewing Jesus Christ: either you accept that He really is God (& you are therefore saved from inevitable self-destruction) or else you reject Jesus as God, & you carry on your merry way. But as my cartoon points out, when your merry way leads to eternal destruction in the unending flames of Hell, just how merry is it going to be, really?! Verse 24 continues, “But to those called by God to salvation, both Jews and Gentiles (that is Christians), Christ is the mighty power of God and the wonderful wisdom of God. This “foolish” plan of God is far wiser than the wisest of human plans, and God’s weakness is far stronger than the greatest of human strength.” This passage is essentially saying that when a person finally realises that they can not save themselves from that long drop into hell, no matter what they do (or read – hence all the books & scrolls in the cartoon), only then are they ready to concede that their own human wisdom is powerfless to truly save them. At that point we are ready to accept Jesus as their personal Lord & Saviour. The truth is that we are entirely powerless to save ourselves. No book, or religion, or mind set, or worldview, or power can save us from Hell, except the saving grace of Jesus Christ. I originally drew this cartoon A4 (297 × 210 mm) in size (as per usual), but there wasn’t enough room to draw all the figures! So I drew it A3 (420 × 297 mm) & had to scan it in 2 halves. I was very pleased with the greyscale & simple coloured versions, which preceeded the final, coloured version. You can see these versions & the close up details of the figures on the BC Blog for 20/08/2010. Here’s a simplified version that I created to make sure the colours would work together, before investing time to create the final, finished scene. 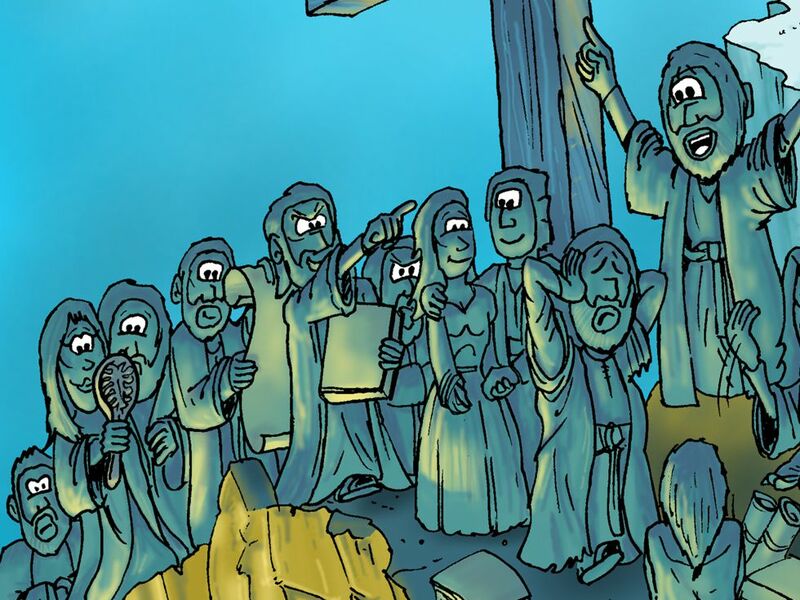 Here’s a close-up of the people walking towards the cross, on the left hand side of the picture. Notice the various expressions and reactions to the preacher’s words: disbelief, ridicule, disinterest, dismissive. 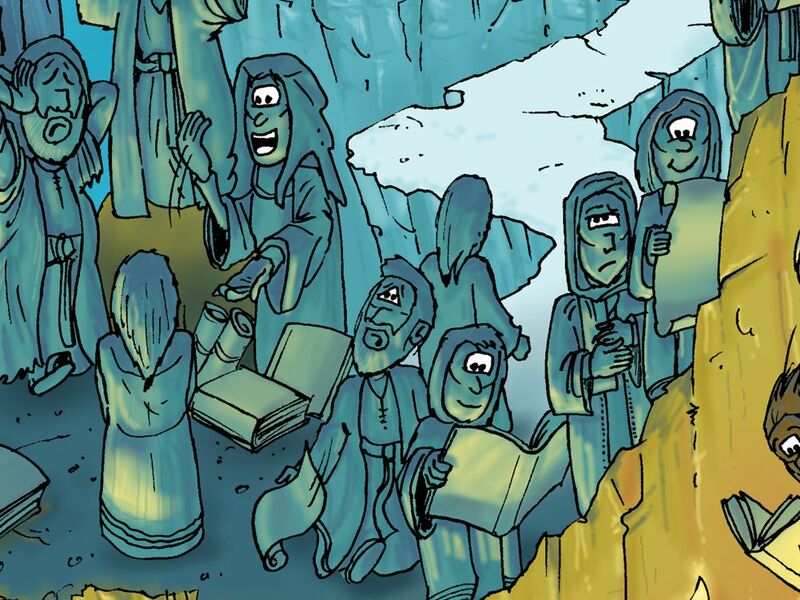 Here’s a close-up of the preachers and the people in the middle of the picture. Notice the various expressions and reactions to the preacher’s words. One man is dropping his “distraction” scroll and pondering the words of the preachers. 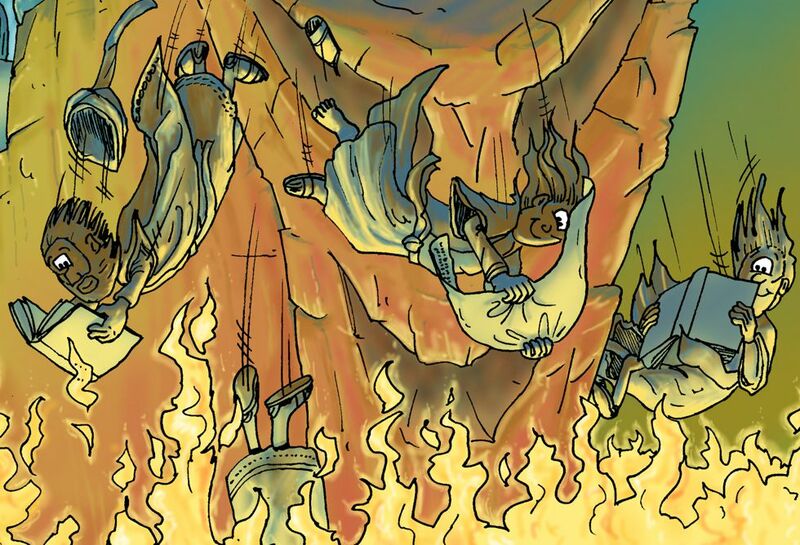 Here’s a close-up of the people falling into the flames – unfortunately it’s a bit late for repentance now. Click the blue box below to read my BC Blog article, with more comments about the people in this cartoon.